The world of business and everyday life has changed; now, technology is at the heart of nearly every industry. Technology is drastically transforming everything, with the use of cloud services, the need for heightened cybersecurity, and data centres being common practice. Cisco Systems, Inc. offers a huge range of products fit for the digital era, specialising in networking and communications but also offering services and products in routing and switching, storage networking, unified connections applications, data centre and cloud management solutions, and telepresence. The Silicon Valley-based technology conglomerate is widely respected and utilised across the world, making professionals who can boast certifications from their career path desirable among those seeking technological solutions. Cisco Systems, Inc. also offers a comprehensive and expansive career certification programme which ensures that professionals have the knowledge and skill set necessary which support and utilise Cisco products to solve the technical needs of customers. The clear paths established by Cisco Certifications detail entrants working from Entry level to Associate and then Professional. 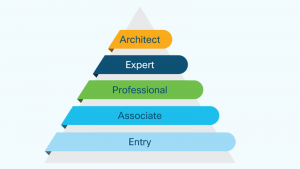 If they so choose, professionals can then become Experts through the certifications course and go another step to become an Architect if following the Design path. Here, we’re going to breakdown the many career paths that the Cisco Certifications offer, enabling you to see the different professions that you can follow and the stages involved with each course. Cisco Certifications offer ten career paths, five of which may require you to start with an Entry certification. To move on to the Associate level in Routing and Switching, Security, Wireless, Design, or Industrial, you need to earn the CCENT certification, for which it is recommended that you take the Interconnecting Cisco Networking Devices Part 1 training. You can take this certification before embarking on any Cisco path, but for the five careers listed above, it can be a necessity. Those who wish to embark on the Data Center career path need not earn the CCENT certification at the Entry level and can instead work towards the Associate certification (CCNA Data Center) as their first step. After completing the Associate stage, you must then complete the CCNP Data Center course for the Professional certification, which features five exams. If you then wish to attain an Expert-level certification, which is optional, you can take the CCIE Data Center course. The CCIE features one written exam but requires seven years of job experience to enter. For the Routing and Switching career path with Cisco, you must complete the Entry-level CCENT course; after that, you can work toward the Associate-level CCNA Routing and Switching qualification. Once you have completed this stage, you move onto the required Professional-level CCNP Routing and Switching certification which features three exams. You then have the option to go for the Expert certification, CCIE Routing and Switching. To enter the CCNA Collaboration course at the Associate level, you don’t require the Entry certification but will be required to complete the Professional course after passing the two exams. For the CCNP Collaboration certification, you will face four exams and should you be certified, you can then move onto CCIE Collaboration if you wish to attain an Expert certification. The Security career path will often start with the Entry-level CCENT certification. However, the Associate-level stage (CCNA Security) comes with the prerequisites of having the valid CCENT or any CCIE certification (any Expert-level certifications bar Expert Design), or a valid CCNA Routing and Switching certificate. Having completed CCNA Security, you move onto the Professional stage of CCNP Security and then have the option to move onto CCIE Security to attain Expert certification once you have seven years or more of job experience. Cisco’s Cyber Ops course is a one-stop path without any prerequisites, but it does recommend that you have completed to training courses of Implementing Cisco Cybersecurity Operations and Understanding Cisco Cybersecurity Fundamentals. CCNA Cyber Ops features two exams, and you don’t need to earn Entry certification. The Wireless career path with Cisco requires you to have either the CCENT Entry certification, a valid CCNA Routing and Switching certification (which is the Associate level for that path), or any of the CCIE, Expert-grade certifications. Once you attain the CCNA Wireless, you move onto the four exams of the CCNP Wireless to land the Professional-grade certificate. You then have the option to go for the CCIE Wireless once you have accrued seven years of job experience. While you are not required to have a valid CCENT or any other Cisco certification to start the Associate-level CCNA Service Provider course, it is strongly recommended that you have at least one year of experience of working in an SP network environment. The Service Provider path is also a two-certification track with the option of moving onto the Expert certification of CCIE Service Provider once you’ve earned the CCNP Service Provider and compiled seven years of experience. Cisco’s Design career path is the longest if you wish to reach the top level of certification and is the only path that boasts five stages. To enter at an Associate level and go for the CCDA, you need to have earned the Entry-level CCENT, have any Expert-level CCIE certificate, or be CCNA Routing and Switching certified. Once you’ve completed CCDA, you move onto CCDP at the Professional level, which has three exams to pass. You then have the option of moving onto Expert certification, but you are also required to complete the next step of Architect. With the CCDE written and practical exams passed, you can then access the top-tier CCAr course, which finishes with a board exam. You are not required to be CCENT certified to start to CCNA Cloud certification course. Once you’ve completed the Associate level, you’ll then move onto the Professional certification of CCNP Cloud, which features four exams. CCNA Industrial is a single certification at the Associate level. To enter, you must have any valid CCIE certification and IMINS2 or CCNA Routing and Switching, CCENT, or IMINS. This certification has only one required exam but recommends that you’ve completed the Managing Industrial Networking for Manufacturing with Cisco Technologies training course before attempting the certification. As you can see, achieving the CCNA Routing and Switching and CCENT certification can be very helpful if you wish to be certified down multiple career paths. With so many clearly established career paths, Cisco offers you the perfect way to build into your ideal career.